Hamelin is a town located in Lower Saxony, Germany. It is famous for the legend of the Pied Piper of Hamelin, a tragedy which occurred in the town in the 13th century. The legend tells how the Pied Piper lured 130 children away when the citizens of Hamelin refused to pay him for having rid the town of a plague of rats. An account of the legend dating from 1450 states: ‘In the year 1284 on the day of Saints John and Paul on 26th June, 130 children born in Hamelin were led away by a piper clothed in many colours to their Calvary near the Koppen, and lost’. Several authors including Goethe, the Brothers Grimm, and Robert Browning have written about the legend. Today Hamelin has a population of around 56,000. The Pied Piper story is popular around the world. As a result the town attracts a large number of tourists annually. During the summer months a play about the tale of the Pied Piper is performed every Sunday in the town. 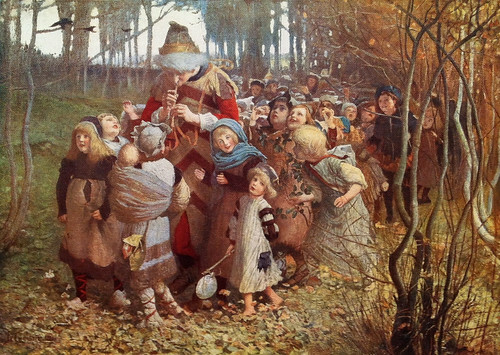 The Pied Piper, according to legend, lured 130 children away from the town of Hamelin in the year 1284 On This Day.